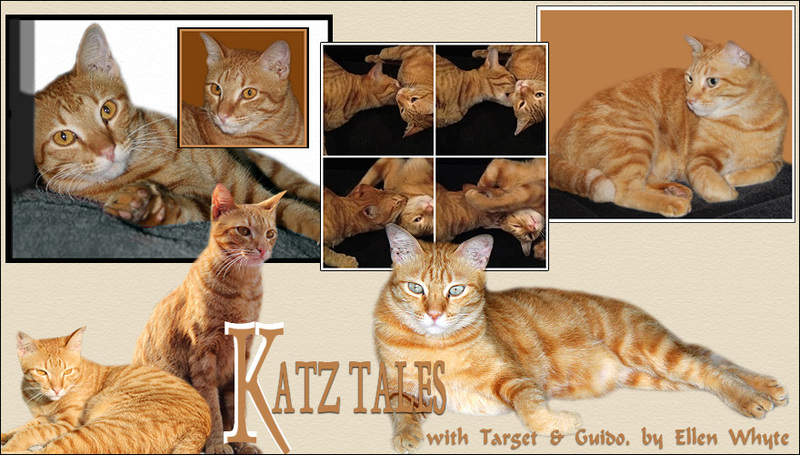 Katz And Other Tales: Tail Lashing! Scoop and Au have many friends. Au visits his friend Halim across the road for a quiet bit of fish washing, while Scoop enjoys spending time with Lillian who adores him in a style Scoop considers proper. They also enjoy visits from Sasi. She's soft spoken, doesn't try to pick them up, and responded well to requests from Scoop to hand over that bit of chicken that's resting in the oven, and from Au to hand over the ham from the fridge. What's nice about these relationships is that they build bridges. As with every meeting between strangers, body language is a real mystery. Cat people like Scoop and Au are quite likely to misinterpret a hasty movement as a threat, while human people like Sasi seem to at a loss to understanding basic cat body language. One of the most perplexing signs is tail lashing. For people accustomed to dogs, a waging tail is a good thing. But with cats a lashing tail is most often a warning to say, "I'm not happy and if you don't stop that, I will bite you!" Cats are complicated creatures. And I guess that's why I love them so. Pepper has this habit of tail lashing everytime she is around people. At first, I thought that she is uncomfortable or dislike something we do. But even when she is rubbing her head on ur legs, her tail is still lashing from left to right. I then did a quick search on the internet that say that cats sometimes lash their tails when they are happy. You hardly see any tail lashing by my other cats. But with Pepper, its ALL the time when she is with people. I guess she is just a natural people lover.